Yesterday afternoon I had just stepped out of a meeting in midtown and looked at my phone. My wife had sent me a text about the bombs that went off at the finish line of the Boston Marathon. I was stunned by the news and had difficulty with the idea that it happened. I hoped it was a prank, perhaps something innocuous like a smoke grenade, but I had the feeling it was much more than that. I had a little time before my next meeting, so I stopped into a nearby hotel to watch the coverage on CNN. As the story unfolded, it felt eerily similar to that day in September back in 2001 (my look back on that day). I'm not going to talk about the horrible events themselves, or why some people decided that their twisted view of life was worth the life of a child, along with the deaths and carnage of others. The story that the world is hearing is about how the workers, spectators, police, EMTs, firefighters and residents responded immediately to those who needed help. If there is any justice, the malevolent animals who picked easy targets will be quickly captured and shown to the world as the cowards that they are. I suggest they be forced to run the Boston course indefinitely until they expire. I had a weird run this morning. Besides having a lot on my mind, I'd gone to an industry event last night that put me well past my bedtime. If you looked at the metrics of the run, it would appear that I under-performed compared to my usual level. 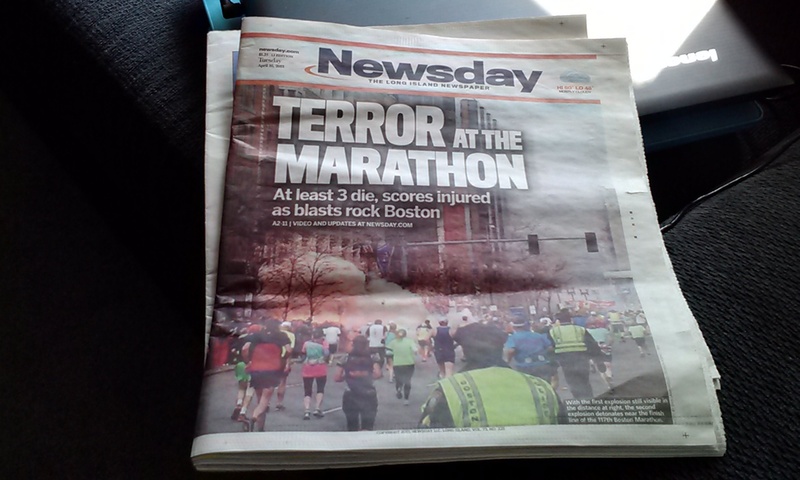 The entire time that I ran I couldn't shake the post 9/11-like feelings that resulted from yesterday's news. I think I ended up pushing harder than I normally would have on a weekday training run and, by the end, I was pretty tired. It wasn't a particularly notable run for me, but I think I processed a lot of thoughts and have come out better for it. I'll bet being a runner would have come in handy on September 12, 2001. I can't go back in time, but I'm happy that I was a runner today.